You can look and touch, but you're not quite ready to drive. 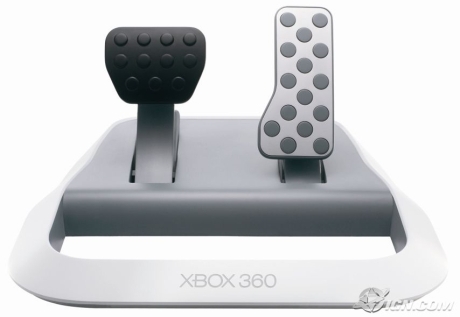 September 14, 2006 - It has been a while since console gamers have been able to enjoy their racing games the way real fans of the genre should -- with a first-party racing wheel peripheral. Microsoft is bringing them a Wireless Racing Wheel for the Xbox 360 on November 1 packaged complete with a force-feedback version of Project Gotham Racing 3 for the retail price of $149.99. IGN got our first hands-on with the wheel today. Unfortunately, we felt a bit like kids at the arcade who are out of quarters but sitting in a game and steering anyway, because they couldn't let us demo the wheel with a game or hooked up to the X360. We're pretty damn picky when it comes to racing wheels. A really great gaming racing wheel should give you a much deeper level of immersion; it should feel and respond like the real thing. It is a harder goal for the designer of a racing wheel, because with other peripherals like a joystick or even a lightgun, your average gamer probably hasn't actually flown a F-18 or fired an AK-47 so any disparity between reality and simulation isn't as great a divide. Most people have driven a car, though. 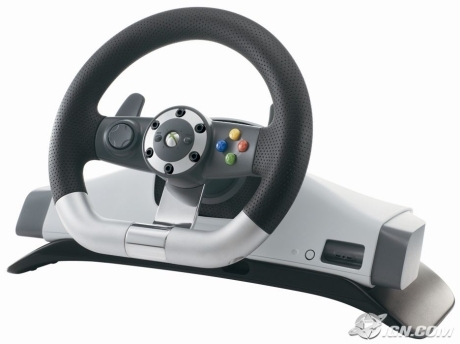 Luckily, so did the team behind Microsoft's Wireless Racing Wheel. You have the option to rest the wheel in your lap or attach it to a table. The wheel itself is weighty enough not to feel flimsy, but not so heavy that it was uncomfortable in our laps. It is balanced enough, and wide enough that it didn't want to tip. Naturally, the wheel feels a lot more stable attached to the table. It cranks on to fit the table quickly and easily. The wheel has 270 degrees of motion and feels comfortable and solid. Considering that the Forza Motorsport 2 team has helped with the design we're looking forward to taking it for a spin with a real game (once Microsoft lets us have a few quarters). ny racing wheel superfan has probably killed a few flimsy pedals during heated races. During especially suspenseful moments it is natural to tend to STOMP a lot. We kicked these pedals pretty firmly and they didn't complain. Pedal systems have long struggled with a design that won't slide around on whatever surface you happen to be using. Microsoft has solved this problem with a new design which has a cutaway frame at along the base of the pedals that comfortably accommodates a player's heel where you naturally would rest your feet. It helps to keep the pedals from doing much sliding around. The pedals also have tiny foam feet to protect hard floors from any damage. The wheel uses the same batteries as the X360 controllers and can be quickly switched out. Microsoft said they expect the batteries to last about 20 hours on average. We asked what sort of warranty the wheel will come with, but they were unable to answer by the time we went to press.